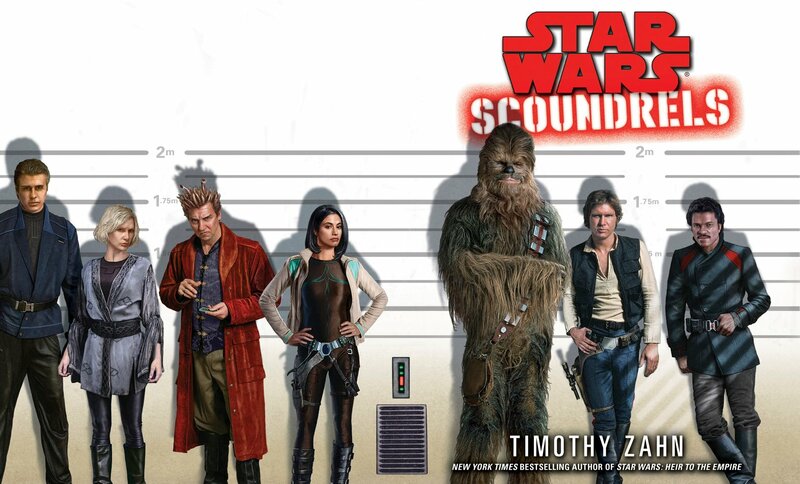 I haven’t read a Star Wars book in years, but this one sounded like too much fun to pass up: Star Wars: Scoundrels, a novel by fan favorite author Timothy Zahn that essentially stars Han Solo as Danny Ocean in Ocean’s Eleven. Due out in early January 2013, Scoundrels takes place between A New Hope and Empire Strikes Back, bringing together Han, Chewie, Lando, and a new cast of characters going after a score so big it will solve Han’s little Jabba problem forever, if only they can pull it off. As is often the case with con/heist stories, at times the plan is so convoluted that I couldn’t quite tell what was going on, but to be honest that didn’t really bother me. I was impressed with Zahn’s ability to give the eight new characters on Han’s temporary “team” disparate enough personalities that I didn’t need to refer to the dramatis personae list at the front of the book – and that’s in addition to the villains, who are equally distinctive. While it didn’t seem entirely natural to watch Han trusting people, having the patience for the long con, and advising people to get some sleep and turn out the lights on the way to bed, this book somehow works just fine. It also doesn’t hurt to have a Star Wars novel with familiar faces, set in this time period instead of decades later, when apparently almost every character has developed Jedi abilities and has temporarily turned to the Dark Side of the Force. I understand additional “standalone” novels in this timeframe are forthcoming. There are some slight missteps that might have been caught in editing (and since I read a galley, maybe they still will be). “Chance cubes” are “chance cubes” except for the one time they’re referred to as dice. There’s a reference to “middle grade children” that throws me out of the Star Wars 'verse and back into suburban America, as well as extensive use of dumbwaiters during the heist. While I can buy that alien cultures might invent convenient “elevators” to move food and supplies from one story of a residential building to another, it seems a bit odd that they would also name theirs after mute food service personnel. There’s even a football metaphor. Who knew that in a galaxy a long time ago and far, far away, they not only have Earth sports, but 20th century American sports? As said, these lapses are minor, but they do briefly interrupt the mood, and give the effect of slight carelessness. On the plus side? There are some fun inside jokes, including an entire scene that pays homage to Raiders of the Lost Ark. There’s a funny paragraph in which Han sums up his role in A New Hope as only he can, and an amusing poke at scriptwriters who like to use turbolifts as the ideal spot for heroes to break free from their captors. Heck, I even enjoyed constructing a little chart that might help a writer deal with Chewie’s dialogue, for which there’s apparently a “no direct translation” rule. We never know what he actually says, only that there is a limited number of iterations in which he growls/rumbles/warbles his agreement/assent/question/objection. (To be fair, I think the “no direct translation” rule is probably the right way to go, but the limitations thereof are still amusing.) I liked the use of “kriffing” – not as good as frakking or frelling, but not bad. And there’s a direct poke at the “who shot first” question – not that it’s really a question, in my opinion. It doesn’t go quite in the direction I’d have chosen, or as far as I’d like, but it’s still cute, and there’s only so much you can sneak through the approval process, I’m sure. Overall verdict: if you find the shelves upon shelves of Star Wars books at the bookstore too much to contemplate, with their complicated storylines that sometimes seem to be spinning their wheels, this is the book that will let you get back to basics and have a lot of fun while you're doing it. Besides, who can resist that cover? Read more!